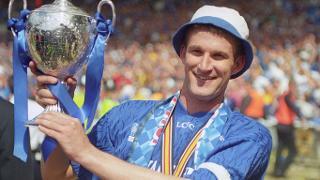 England Under-21s international midfielder Mark Draper became Leicester City’s first £1M player when he signed for Brian Little in July 1994. Earlier this year, Mark spoke to Club Historian John Hutchinson about his early career at Notts County, for whom he played in the top-flight, his international experiences and his Premier League career, not only at Leicester City but also at Aston Villa and Southampton. Mark’s football journey began at Notts County as a youngster, he explained: "I was at Notts County from the age of nine, and was with them all the way through the system. It was different to nowadays as you could still play for your local club. Players like Ian McParland and Iain McCulloch were there which was quite daunting when you are a schoolboy. In 1987, in my first year as an apprentice, John Barnwell came in as manager. He gave me my debut at Wolves away. That was in 1988 when I was still 17." Soon afterwards, Neil Warnock became manager at Meadow Lane and Mark was a key figure in the side which rose from the third tier to the top-flight between 1989 and 1991. Thinking back to this time, Mark continued: "Looking back, me and Neil had a few fall-outs, but then I think I fall out with everybody! Neil taught me a lot to about the game and he has since gone on to prove to be an amazing manager. "When we got our back-to-back promotions, Warnock bought one or two players but there was no big money spent. It was all about team spirit. He brought players who he knew would do the job that he wanted them to do. If you didn’t do what he wanted, he wouldn’t play you even if you were playing well. Simple as that! He was a master of picking players from lower leagues who could step up and do a certain job for the team. That was the biggest talent he had really. "A few of years ago, we had a 25th anniversary reunion about the back-to-back promotions at Notts County. Warnock was there and in his speech and he remembered every player and had stories about them all. I don’t think people realise how intelligent you have to be to be a top manager. "Our promotions meant that I was playing in the top-flight when I was 20. I’d probably already played well over 100 games and had two promotions by that time. Looking back, that was down to Warnock. We had some great players there. Dean Yates, a Leicester lad, had come through the ranks. There was myself, Tommy Johnson and great signings like Craig Short and other lads who had been playing in the lower leagues. We formed a great team and had two or three unbelievable years together." Mark then recalled his selection for the England Under-21s side whilst he was at Notts County. I’m not sure what Hagi was doing at second tier Brescia! I’d scored against Brescia in an earlier round. I think this made me the first Notts County player to score a European goal. He said: "For a local lad, coming through the ranks, to get two promotions and to play for the England Under-21s was amazing really. Lawrie McMenemy was the Under-21 manager. I got three Under-21 caps. I could have had a few more. I was twice picked to go to the Toulon Tournament but Notts were involved in the Play-Offs. I played against Germany and Ireland in European Championships qualifying games and also in a friendly against Poland away when (Leicester City’s) Paul Kitson scored." In March 1994, Mark played for the Magpies, (who had been relegated from the top-flight after one season), in the Anglo Italian Cup Final at Wembley. Their opponents were Brescia, whose team included Gheorghe Hagi, who had played for Real Madrid, was to play later for Barcelona and who had been a star of the 1994 World Cup for Romania. Thinking back, Mark remembered: "I’m not sure what Hagi was doing at second tier Brescia! I’d scored against Brescia in an earlier round. I think this made me the first Notts County player to score a European goal." In the 1994 close season Mark signed for Leicester City, newly promoted to the Premier League following their victory over Derby County in the 1994 Play-Off Final at Wembley. Mark recalled: "It was a strange story. There was quite a lot of interest in me and a lot of transfer rumours about me leaving. I’d not signed my new contract. People were expecting Derby to win the Play-Off Final against Leicester and there was talk that if Derby did beat Leicester they would buy me. They’d already got Tommy Johnson and Craig Short from Notts County and their chairman, Lionel Pickering, was spending a lot of money. However, Leicester beat Derby at Wembley and I went to Leicester! "There were a few other clubs who were interested but I spoke to Brian Little and once I’d had a few conversations, I liked what he was saying. I took to him straightaway and decided that it would be a good move for me to go to Leicester. "The two clubs couldn’t agree a fee. I was out of contract so it went to a tribunal. Leicester’s record fee before that was for Mark Blake (£360,000). I think other clubs were probably expecting the fee to be something like £500,000, or £700,000. I went to the panel with the chairman and Brian. Draper made 120 appearances for Aston Villa. "It was a lot of money for those days. There was pressure but at the end of the day you are still the same player that they had bought, whatever price tag they had put on you." Despite Leicester City being relegated at the end of the season which followed, Mark played well that season, more than justifying his transfer fee. He added: "There’s no doubt that I would have stayed at Leicester if they’d survived in the Premier League. When Brian left to manage Aston Villa in December this upset things a little bit. Brian was one of the reasons I went to Leicester. It was a disappointment for me and a bit of a blow when he left but obviously you can’t knock Brian. He was a Villa legend. Once Villa came calling there was no decision in it for him really. It was a no-brainer for him. If it had been any another club, I don’t think he’d have gone. "Even though that season was a tough one, I still really enjoyed it and I look back at Leicester with good memories. There were a lot of great lads there who I still speak to. "My Leicester debut was at Filbert Street against Kevin Keegan’s Newcastle United. There was a big crowd and it was a massive game on Sky. We ended up getting beaten 3-1 and I missed a penalty! It wasn’t the best start but I loved my football and I wanted to crack on. I don’t remember being too down about the way things went that season. "I was called into a couple of Terry Venables’ England training squads when I was at Leicester, but it wasn’t until later that Glenn Hoddle picked me for the main squad. To be fair it was my second season playing in the top flight and I was playing in a struggling team but it was nice to get recognised like this. It was amazing because I was still only 23 or 24 maybe." With Leicester City looking doomed for relegation, fans’ fears that Mark would leave at the end of the season were realised when he departed to join Brian Little at Aston Villa. Getting picked for an England squad is the pinnacle of anyone’s career. It was some squad to get into! The four other midfielders in there were Paul Ince, [Paul] Scholes. Gazza [Paul Gascoigne], and [Matt] Le Tissier! "After Brian left he tried to buy me and Villa and Leicester had agreed a fee on the January deadline day," he explained. "I remember sitting in the office in the afternoon they were discussing terms. However the chairman wanted me to stay and try to help Leicester stay up so the agreement was that I would stay but that I would go at the end of the season if Leicester were relegated and that is what happened. The transfer fee was £3.25M. That was really big money at that time. It was a good deal for both clubs. I really enjoyed my time at Leicester, but for me, at that time in my career, and having had a sniff of England, I had to be playing in the Premier League and when the chance came to do this with Brian again it was something I had to do." Over the next five seasons, Aston Villa were a top-six side in the Premier League. "We qualified for Europe for the first four years I was there," Mark recalled. "In the first year I was there, we finished fourth and won the League Cup and got to the FA Cup semi-finals. I remember going back to Filbert Street on the first day of the 1997/98 season. It was a roasting red hot day and we were beaten 1-0. It was nice to go back to my old club but it was a tough opening day and a good result for Leicester!" While at Villa, Mark was called up for Glenn Hoddle’s England squad: “I don’t think I was picked in the original squad and that somebody dropped out. I got a call from Glenn on a Sunday afternoon. He told me that I would be picked up the next day for the match in Moldova for a World Cup qualifier. Getting picked for an England squad is the pinnacle of anyone’s career. It was some squad to get into! The four other midfielders in there were Paul Ince, [Paul] Scholes. Gazza [Paul Gascoigne], and [Matt] Le Tissier!" Mark went on to recall that, in January 2000, he went on loan to Rayo Vallecano in La Liga: "After John Gregory took over at Villa, things weren’t quite the same and I was out of the side. I’d had a chance to go to Rangers but the deal didn’t quite come off, and then in early January 2000 the opportunity came to play in Spain. I went out there and enjoyed it. I had a few injuries which stalled me a bit. I was starting to pick up injuries at that time. I’d played nearly 500 games from an early age and it was starting to take a toll on me. You played a lot of games in those days. "Nowadays the squads are bigger and you get more time to recover." Draper has worked at Notts County as a coach in recent seasons. It wasn’t long before Mark was back in the Premier League, transferring to Hoddle’s Southampton in another £1M transfer. He continued: “I was just finishing my loan spell in Spain. I knew my time was up with Villa. I enjoyed working with Glenn, who was a top manager. I went out to La Manga for a week’s pre-season with Southampton. Things went well and I ended up moving to Southampton in July 2000. I played regularly for the first year. It went really well. It was the last year at the Dell, but from then on I had a lot of wear and tear and was taking a long time to recover from operations. Glenn moved on to Tottenham. When Gordon Strachan became manager we knew that I was struggling with injuries. He was very straight with me and after a while I decided I was going to retire. "When I first retired I went back to live in Spain for a couple of years but I was too young to sit in the sun for the rest of my life. I came back to England, did my coaching badges and went back to Notts County working with their academy. They didn’t have much money so I helped out doing the kit as well. Tommy Johnson was also back there so things had come full circle really. Then I worked at Stoke City’s Academy. After a couple of years, David Norton, (an ex-Villa player who I had known from my Notts County days), and myself set up our own coaching school. We also run an under-19s football academy at Nottingham University."